Mary Retterath and her husband Dennis of West Allis won $1 million on Powerball Lottery last November 28. The couple received $672,500 after taxes. They bought their ticket at West Allis. The highest USA Powerball jackpot, which is $580 million, will be split among 2 winners. The biggest USA Powerball jackpot in the country was won by two tickets – one from Missouri and the other one from Arizona – in last Wednesday’s USA Powerball draw. The very high demand for USA Powerball lottery tickets has made lottery officials increase the amount of jackpot twice before the Wednesday draw. After summing all the tickets sales, the jackpot prize was recorded at $579.9 million – the biggest in Powerball history. The Powerball winning number combinations were 5, 16, 22, 23, 29 and 6 as the Powerball. The accumulated jackpot prize was the result of 15 consecutive draws with no winner(s). The starting jackpot was $40 million. The Wednesday draw made two ticket holders to become big winners and instant millionaires since they will be splitting the $580 million jackpot. Vickie Jenkins of Culpeper won $1 million on Powerball Lottery last November 24. The winning numbers were 22,32,37,44,50 and Powerball 34. John Cramer of Salem won $2 million top prize on Ohio Lottery. He won just in time for Thanksgiving. Cramer plans on using his winnings to go on vacation in Florida and to help his children. Jimmy Worsham of Kalispell won $25,000 on Montana Lottery's Battleship scratch card. He does not have any major plans yet for his winnings except for few household items and bill payments. Elizabeth Haynes from Mechanicsville won $2 million on Powerball last October 3 draw. Haynes matched the five main numbers which won her $1 million. Because she paid an extra dollar for Powerplay, her $1 million was doubled to $2 million. "It was really exciting," she said. "Once I told my husband it was a lot more exciting!" American Powerball changed their lottery rules this year, with the promise that there would be bigger jackpot prizes and these would be occurring more frequently. So far this year, there have been three instances of jackpot prizes won which are worth more than $300 million. This time around, it's a $425 million Powerball jackpot that is up for grabs. This is only the second time that a United States lottery has broken the $400 million first prize benchmark. By draw time, it is expected to go even higher than $425 million and a lot of people will be betting on that as well as playing the lottery for a chance at historic payout. This figure is only an estimate and could very well be much higher with the expected influx of players trying their luck before the draw. Starting with a $40 million prize, there has been no winner for the past 15 draws, creating this big multi-million dollar prize. With interest running high, it is not a remote possibility that by draw time the prize could reach $500 million or even $1 billion! With an expected $425 million prize, the lump sum payout would be a huge 278.3 million. For after-tax cash and annuity prizes calculations, the USA Mega website has a state-by-state report showing how much the take home could be. Don't be left behind! The Wednesday, November 28, 2012 American Powerball draw is sure to change some people's lives. Click Here to Order your American Powerball tickets right away! Linda Woodruff, retired Army to Virginia won $100,000 in the Sizzling 7's scratch game. She was just visiting her friend when she bought her ticket at a 7-11 in Manassas. She plans on using her winnings to pay for her bills. Tawonda Noel of Roanoke won $100,000 top prize on Virginia Lottery's Black Jack Scratcher. She bought her ticket at 4th Street in Salem. She's the 3rd top prize winner. The other 2 top prizes remain unclaimed. Mahlet Bogale of Alexandria won $312,000 on Virginia Lottery's Win for Life fame. She bought 6 tickets and each ticket won $52,000. “I was surprised and happy,” she said. The winning numbers were 16,18,26,32,38,40 and Free Ball 29. Edward Santiago, a Marine Corps veteran from Middleoro won $10 million grand prize on a scratch game. He hit on a 40th Anniversary Millions instant ticket. It wasn’t immediately clear where he bought his winning ticket or how he plans on using his winnings. David Doyle, a retired Metro-North railroad worker from Rhinebeck won $1 million on $5,000,000 Multiplier scratch-off game. Doyle opted for a lump-sum $661,800. He bought his ticket at Staatsburg. “I feel absolutely great,” Doyle said when he received his check. He was inspired to try his luch after talking to a poker buddy who almost won the jackpot of $5 million. Ron Yurcus, retired hospital chaplain of Glen Ellyn won $1 million on Illinois Lottery last August 22. He only collected his winnings recently as he has forgotten his ticket on his desk. It was sitting there along with the rest of all the tickets he bought for 2 months. He plans on investing the money, donating to charity and sharing it with his three children and four grandchildren. Natalie Blanchard, an agent in Aspen Real Estate Co. won $250,000 on Mega Million draw last October 26. Blanchard declined to be interwieved by Aspen Times. But it was gathered that she is originally from France and has been living in Aspen for more than 20 years. She bought her ticket at Clark's Market. Debra Tillman of Belle Fourche won $40,000 on Mega Millions Lottery. She matched all four out of five main numbers and the Mega Ball in last November 9 draw. She also bought a multiplier option that quadrupled her winnings of $10,000 third prize. She bought her winning ticket at Fresh Start in Belle Fourche. Brothers Andy and Nayel Ashkar were featured last month in a newspaper wherein they waited for 6 years before claiming their $5 million lotto prize. Last November 6, they were arrested for attempting to cash in a $5 million lottery prize jackpot. Their customer at Greenale Market bought a scratch off ticket last 2006. Andy Ashkar told the customer that he only won $5,000 and not $5 million, thus Andry took the ticket. It took the brothers 6 years before collecting the prize and they were related to the owner of the store which gave suspicions to the authorities and investigated the case. They are now facing charges of attempted grand larceny and conspiracy. The customer or the real winner of the scratch ticket came forward after reading the article last month regarding the brothers. He is now cooperating with the District Attorney's office. Lois Walski of Chesapeake won the top prize $100,000 on a Jewel 7's scratch ticket. She asked her grandson to double check her ticket just to make sure. She bought her ticket at Gilmerton Road. She is the fifth person to claim the top prize. A winner of UK National Lotto has ran out of time to claim his GBP3.6 million lotto jackpot prize. Lotto officials said that the winning ticket was bought last May 12 at Lanarkshire. The GBP3,634,865 prize winnings will go to the National Lottery's Good Causes. A group of 15 oil workers from CanElson Drilling won $25 million on the Lotto Max Draw last November 2. Each member will take home $1.6 million. The group plans to keep buying lottery tickets. "I think we discussed already that it would be nice for everybody to go back to work roughly the same time and stay together as a group," he said. "We got a real good group of guys here and it seems to work." Tan Le of Burke won $250,000 on Mega Millions last October 30. He matched all five main numbers and missed the Mega Ball. Thus, he was one the five second prize winners. The winning numbers were 5,12,18,29,56 and Mega Ball 38. Gerald Miller, 51 of Bonaire won $227,245 on the Fantasy Five last September 22. He bought his ticket at Bonaire. He has big plans on his prize. "I'll make house repairs and pay off bills," Miller said. "I'll help my kids in school and pay off my credit cards." A group of 24 Canada Safeway employees won $1 million on Lotto MaxMillions last November 2 draw. Each member will receive $41,666. "It's a nice amount of money," said an employee who wouldn't give his name. "It's pretty exciting. It's a nice 'take care of some things' for some people." All El Gordo and Japan Jumbo Draw lottery fans will definitely be delighted to know the latest option that they have in joining the draws for both games. If in the past you need to subscribe to two different games and pay too much money for it, now there’s absolutely no need for you to do this because for the price of one you can get a chance at winning the jackpot for both game options. How is this possible, you might wonder? It’s actually very easy. OSA created the back to back group play that automatically allows you to join both games simultaneously. Considering the fact that the draws for these two games take its peak during the month of December, this now becomes one of your best chances to really take great advantage of getting that chance to win. OSA also provides back to back group players with Aussie Superdraw Group Play as well so there’s really more chances of winning. Another great thing about this back to back group play product is the fact that it can be purchased by anyone, anywhere in the world except for those residing in countries like the Philippines, Afghanistan, Iraq, Japan, the Netherlands, Pakistan and the United States. So if you are not from any of these countries and you want to try your luck with El Gordo and Japan Jumbo Draw, there’s really no reason for you not to. Now that you have more than information about this product, what are you still waiting for? If you haven’t tried lottery ever before, this can very well pave the way for you to experience beginners luck. Shiryl Stevens, 52, from Tallula, won $1 million on the Illinois Lottery's Halloween Millionaire Raffle draw. Stevens who worked for 30 years at Illinois Lottery, just retired 10 months ago. She and her husband of 21 years, Albert "Junior" has no immediate plans other than to enlarge a pond on their property. And they updated their wills. A winning ticket won $250,000 on Mega Millions Lottery will expire on November 8,2012, 4pm. The ticket was purchased at Walter's Pipe Shop, 122 W. Lafayette Blvd in Detroit. The winning numbers were 5,31,45,47,54 and Mega Ball 4. If this prize goes unclaimed, the money will go to the state School Aid Fund which is the beneficiary of all Lottery profits. Judith Scheibelhut and William Fitzpatrick from Maple Shade won $3 million on Pick 6 lottery. The couple has been long time players and play the lottery 3 days a week. When the couple confirmed their winnings, Scheibelhut "put her hand up for a high five and said, 'We won!'" Lena Eaton, 91 year old grandmother from Indianapolis won $99,999 on Scorchin' Hot 9s scratch ticket. Prior to this, she won $300,000 on Quick Draw last August. She started home improvements with her previous winnings so she plans on travelling with this recent prize winnings. She will be helping her children, grandchildren and great grandchildren as well. Julie Cervera, grandmother from Victorville won $23 million on California SuperLotto Plus last May. She bought the winning ticket with her last $1. She forgot her ticket for 5 months in her car until one of her daughters texted her to let her confirm the woman her daughter saw in the news. She claimed her money days before its expiry on November 25. Cervera opted for a lump-sum of $17.8 million and plans on paying off her sister's home, helping her children and grandchildren and her two adopted sons. "This means I will be able to help have my kids and grandkids taken care of," Cervera said. OSA has taken to the latest fad in online info marketing – infographics! If you’re a person who knows not a thing about these lottery games and would like to be introduced, get on board through these colorful poster images. OSA infographics are very informative, providing you with a background and trivia about each game, and with vivid cartoon images to accompany them. The “More Info” link will lead you to the most basic of how-to’s. By the time you’re done reading them and following the link, you’ll feel like you can actually be an expert. And for people who are so into lottery and want to know more about their favorite games, these infographics will let you know everything you want to know. For instance, are you aware that Italians spend over US$2.7 billion in a year? And that the Spanish El Gordo Draw is the oldest lottery in the world? 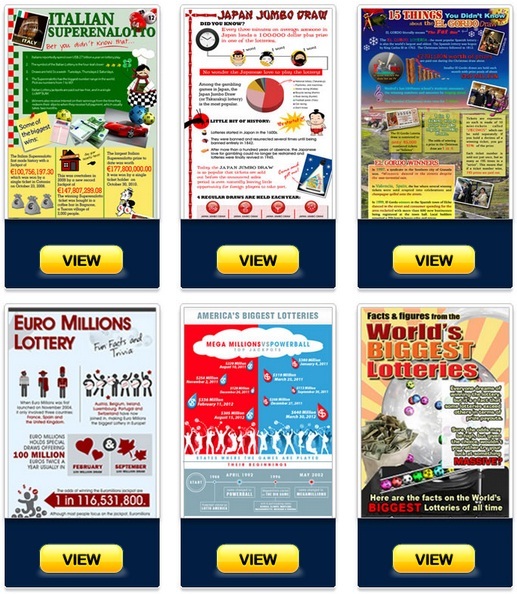 Get more intimate with your favorite lotto game through this new feature of OSA by clicking on the “Infographics” tab on top.